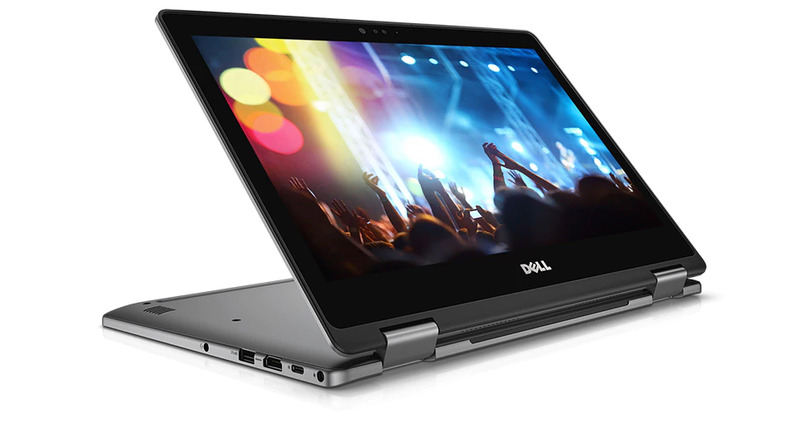 Dell has launched the new Inspiron 13 7000 convertible and Inspiron 15 5000 notebooks powered by AMD Ryzen APUs without much fanfare. Both notebooks come with options of either the Ryzen 5 2500U or the Ryzen 7 2700U APU and are available in a range of price options. However, initial user reviews on Reddit have criticized Dell for reusing a 2016 Inspiron 13 7368 chassis. Away from the glitz and glamor of the recent XPS 15 9570 and Alienware unveils, Dell has quietly launched two new Inspiron laptops without much fanfare. Dubbed the Inspiron 13 7000 2-in-1 and the Inspiron 15 5000, these new notebooks are powered by AMD Ryzen APUs and offer a range of configurations at relatively affordable price points. The Inspiron 13 7000 2-in-1 convertible comes in two flavors — one powered by the Ryzen 5 2500U with Vega 8 graphics and the other powered by the Ryzen 7 2700U with Vega 10 graphics. Memory can be configured up to 16 GB of DDR4-2400 RAM although, Dell offers the 8 GB and 12 GB variants in the config choices. Thanks to a Reddit user, who bought the Ryzen 5 2500U variant, those looking to upgrade the RAM later can rest easy knowing that there are 2 DIMM slots and the 8 GB option comes in a 2 x 4 GB configuration. The storage comprises of a 256 GB SSD. The 13.3-inch FHD touchscreen IPS display is LED-backlit and has a wide-angle webcam with IR for facial recognition and authentication via Windows Hello. Although the display is a touchscreen, Windows Ink is not supported. The Inspiron 13 7000 2-in-1 is fairly well equipped with regards to ports and I/O — on the right you get a power button, volume control, SD card reader, a legacy USB 2.0 port, and a Noble lock slot while on the left, there's an AC Power in, USB 3.1 Type-C, HDMI, USB 3.0 with PowerShare, and a combo 3.5 mm audio jack. The notebook is powered by a 42 Wh battery, which is on the lower side compared to other Ryzen Mobile-powered notebooks. Then, we have the Inspiron 15 5000 notebook with a 15.6-inch FHD IPS display in both touch and non-touch variants. Apart from the choice of the Ryzen 5 2500U and the Ryzen 7 2700U, there is also a Ryzen 3 2200U with integrated Vega 3 graphics on offer. The Ryzen 3 SKU tops at 16 GB DDR4-2400 RAM while the other SKUs can be equipped with up to 32 GB of memory. The highest end config comes with a 512 GB SSD whereas the others make do with a 1 TB 5400 RPM HDD. Unlike the Inspiron 13 7000, the Inspiron 15 5000 does not have an IR camera but comes with an inbuilt Windows Hello-compliant fingerprint reader. Battery and port selection is the same as that of the Inspiron 13 7000 2-in-1 but the Inspiron 15 5000 is fitted with an optical drive as well. While it is always welcome to see Ryzen Mobile being embraced by more OEMs, the current offerings somewhat come across more as a 'me-too' attempt rather than something unique. Even considering the new Inspiron 13 7000 2-in-1, the chassis has not changed much from the 2016 Inspiron 13 7368. Ryzen mobile has proven its worth in many tests and we would like to see more laptops take advantage of its capabilities. The Acer Nitro 5 (2018) for example, brought Ryzen Mobile to gamers while the HP Envy x360 made for an overall capable convertible. For AMD 'Raven Ridge' Ryzen Mobile to truly take wings, OEMs need to dish out more premium offerings and an array of configuration options that cater to all types of users.